Reviews are in for “Unlock’d” — a new musical presented by students in the University of Southern Maine’s (USM) Department of Theatre and School of Music — and consensus is the show was a success. "Unlock'd," a delightful “modern-ish musical romance” about the roles we are born into and people we secretly wish to become, was praised by the Bangor Daily News for its professional quality cast, costuming and set, while the Portland Press Herald called the show “sublime, sharp-witted and fun” and said the cast "shone brightly in their sublimely absurd roles." “Director Sara Valentine and music director Ed Reichert, both USM faculty members, wring every ounce of silliness and satire from “Unlock’d” without resorting to parody,” BDN reporter Judy Harrison said of the show. The show ran March 1-10 in historic Russell Hall on the USM Gorham Campus. Watch a video from rehearsal below. "Unlock’d," written by Maine native Sam Carner, is a whimsical coming-of-age story, fusing baroque and classical music with contemporary pop musical theatre. It is based on a satirical mock-epic poem by the English writer, Alexander Pope. The original musical from the American musical theatre songwriting duo, Carner & Gregor, premiered Off-Broadway in 2013 and is a recipient of the 2014 Richard Rodgers Award. 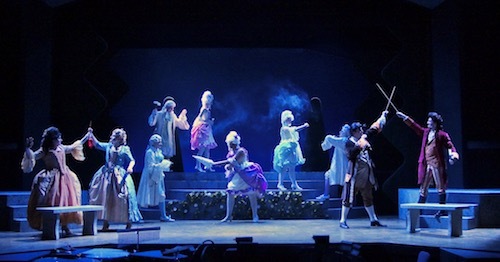 The performance at USM was the first production of "Unlock'd" in New England. Featuring music by Derek Gregor and book and lyrics by Sam Carner, the show was directed by Sara Valentine, assistant professor of theatre with musical direction by Edward Reichert, lecturer in musical theatre. 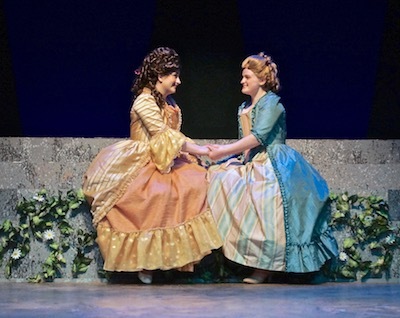 Meg Ward, a senior musical theatre major who plays the character “Belinda Fermor,” said working on the show with Valentine helped to break her out of her comfort zone and be as silly as possible for her character. Musical theatre major Ben Walker-Dubay agreed. “It’s not something you get to do every day, that you get handed a brand new piece of work and also get the opportunity to have that person who wrote it come work on it with us,” Ben Walker-Dubay said. Reichert, the musical director, said he brought Carner in to present a master class with musical theatre majors a few years ago. Carner, whose parents both taught at USM, began his musical theater career with the Children’s Theatre of Maine and now lives in Manhattan with his wife and son. In 2004, Carner and Gregor won the Richard Rodgers Award for the first version of “Unlock’d,” according to the Portland Press Herald. The award is given to help subsidize New York productions by developing artists. In 2015, Carner won the $100,000 Ed Kleban Prize in 2015 for excellence in songwriting. Valentine, “Unlock’d” director, said she and the cast have been looking at the ideas of perspective and forced perspective, and tried to answer difficult questions along the way. “‘Where do we place importance, how do we see the world, and can we see from a different perspective, or acknowledge that the way we've been presenting ourselves to the world has been at the expense of another's feelings or needs?’ Those questions have allowed the students to explore the boldness of the characters, while still finding the moments of truth that make this story so endearing,” she said. Cast: Samuel Allen, (Baron Windsorloch), Harpswell; Matty Boyd, (Umbriel/Zeus), Medford, NJ; Andrew Carney, (Barney the Gnome), Lewiston; Mikayla Clifford, (Gertrude), Gray; Ezri Donnangelo (Lord Littlewit), Yarmouth; Abram Dwyer, (Sir Flittybud), North Yarmouth; Noli French, (Beatrice/Serving Maid/Sylph Understudy), New Gloucester; Arianna Gordon, (Swing for Sylphs/Ladies/Beatrice), Strong; Aaron Kircheis,(Inconstatine/ Edwin Understudy), Bucksport; Ayanna Main, (Esther), Wiscasset; Megan Mayfield, (Avia/Clarissa Understudy), Marlborough, MA; Caitlin McGonigle, (Madeline), Brentwood, NH; Victoria Stackpole(Ariella/Belinda Understudy), Biddeford; Nash Tasker, (Caleb), Berwick; Ben Walker-Dubay, (Edwin Shearing), Kennebunk; Megan Walz, (Katherine), Portland; Meg Ward (Belinda), Bangor; Abby White, (Clarissa Evers), Dalton, MA; Brandon Wong (The Gardner/Swing for Gnomes & Gentlemen), York. Orchestra: Lynnea Harding, violin; Cameron Prescott, cello; Jacob Cooper, guitar; Eric Yim, percussion; and Ed Reichert, piano/conductor. USM Theatre, Music present "Unlock'd"
USM Music, Theatre present "Unlock'd"